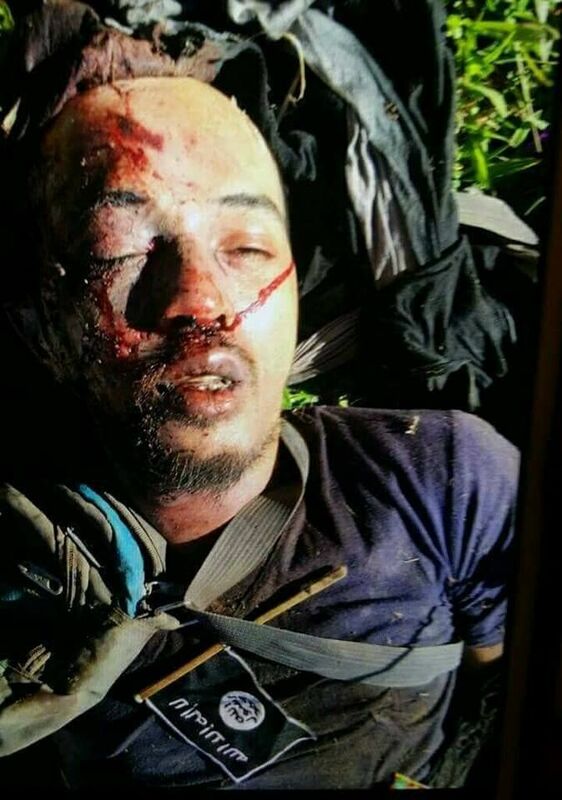 The death of Muammar Askali alias Abu Rami is, in a way, bad news for some communities in Sulu that had benefitted from the ransom money he got from kidnappings. 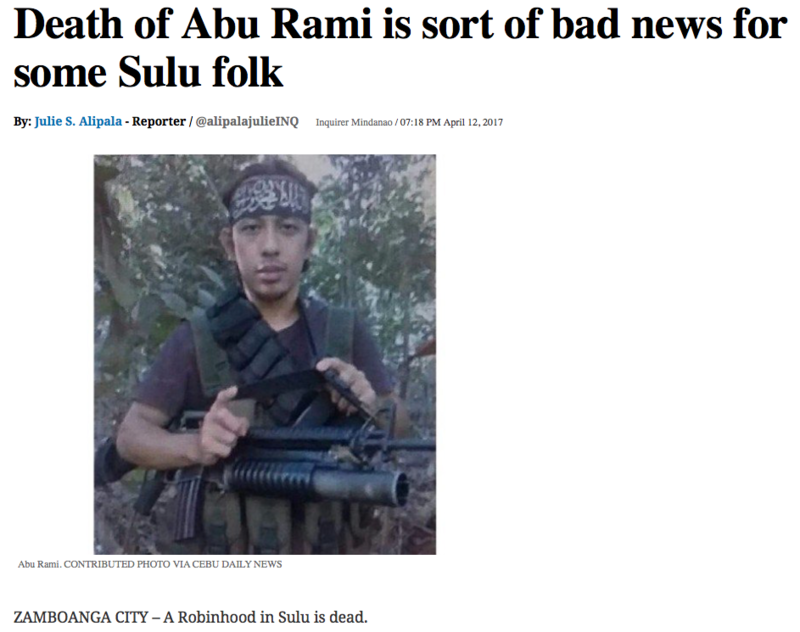 Oh the poor communities of Sulu! Now how will they eat? This brave young man kidnapped innocent tourists and demanded ransom from their country's governments. And not for himself! Oh no this brave young man did it all to feed the people. In previous phone interviews made by the Inquirer with Askali, he confirmed receiving P250 Million ransom for German couple Stefan Viktor Okonek and Henrike Dielen; P20 Million for the liberty of Filipina Maritess Flor; and P30 Million for Kjartan Sekkingstad. But where does the ransom money go? “They need the money to silence the community to get their loyalty. That’s how it works there in Sulu,” he said. “And before this report about Bohol came out, we had several friends who sent Malaysian-made noodles to him, and advised him to leave the kidnapping and beheading,” the source said. But he in his zeal for the poor would not be deterred. “And I guess he went to Bohol to get new captives,” he added. 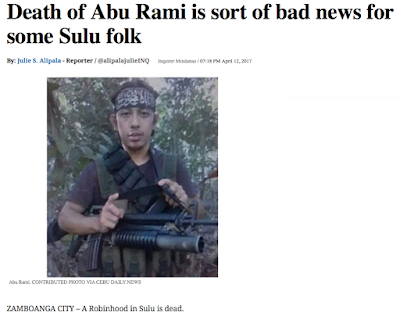 The source said Askali and his group would not be bringing firearms with them if they went to Bohol for a vacation. How selflessly did he and his band of merry men travel about the provinces looking for men to take captive for ransom. Oh how he selflessly dipped his blade in blood and beheaded those whose governments would not pay the ransom which helped to feed his beloved community. And oh how now shall the poor folk in Sulu live? And how will that band of merry men survive if they have no money to buy the cooperation of the community? Will the poor remain loyal to the poor? Will that band of merry men merrily dissolve now that their Captain is gone into that good night? The beauty of Sulu is slain upon the high places. Oh how are the mighty fallen in the midst of battle! Oh that my head were waters and my eyes a fount of tears that I might weep day and night for the death of this young man who spilled his blood for his community's sake. Until their last days the fire of his loss will remain in the hearts of the poor of Sulu. May Allah have mercy on his soul who beheaded the innocent to feed the poor.